Aloe, you’ve seen it on store shelves next to all the sun tan lotions and oils. You know to slather on sunblock when you're out in those rays, but if you get burned you also know aloe helps soothe the hurt. What exactly is it? “Aloe is one of the few natural substances scientifically proven to improve wound healing that,” explains Ahmed Abdullah, MD, FACS, FICS, an internationally recognized expert on the restorative and medicinal effects of aloe vera. Bio 101: Aloe is a succulent plant that features thick, fleshy leaves. These leaves contain a gel that is loaded with more than 75 active components, including vitamins, minerals, amino acids, enzymes, polysaccharides, fatty acids, and more. It acts as an anesthetic, thereby alleviating the pain of burns and wounds. It has antimicrobial properties. This is important because bacteria are a main cause of several skin conditions, including acne. It is an anti-inflammatory. 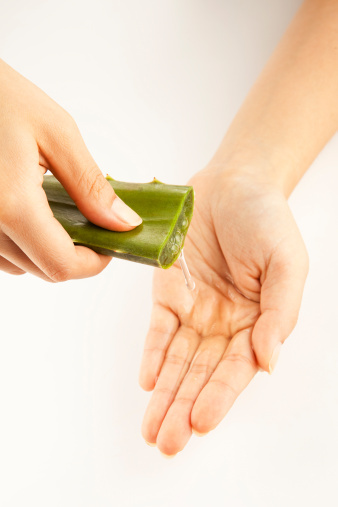 Nearly all skin conditions stem from inflammation, making aloe an ideal remedy. It is proven to heal wounds. Aloe's ability to help regenerate cells makes it useful in treating numerous skin conditions while improving the overall condition and health of the skin. You also need to be aware, that applying the raw plant to your skin isn’t the best option. Dr. Abdullah recommends you use only a purified grade of aloe gel or pharmaceutical-grade. Store shelves are often lined with aloe vera products. How do you know which one will give you the best results? Dr. Abdullah says to look for a product that uses a high concentration of the ingredient and pure aloe. A product's ingredient list holds the answers, “Since ingredients must be listed in order of concentration, you want to see it in the first position. You may also look for the seal of the International Aloe Science Council, a non-profit trade organization that certifies high-quality aloe,” says Dr. Abdullah.